Aston Workshop The Left Hand Drive Conversion Specialist! We now specialize in LHD & RHD conversions using the latest EPAS technology for DB4, DB5, DB6 & V8 models. The electronic power assisted column is completely hidden underneath the dash with no visible signs from within the vehicle or even in the engine bay. The system doesn't alter the character of the vehicle in any way and in fact enhances the driving experience. It is truly quite staggering how even parking becomes a surprisingly easy task. It is only when the system is switched off that you can fully appreciate how beneficial the conversion is to your Aston Martin. The whole system can be turned off simply by the flick of a switch at any time and in the unlikely incidence of a power failure the column will revert back to the feel of a standard column unlike hydraulic systems that can suddenly become extremely heavy in the event of a failure such as a belt breaking or fluid leak. The column is completely silent in operation and the level of assistance can also be adjusted to suit any driver. Columns can be fitted to either positive or negative earth vehicles and are available for both right or left drive models. All conversions are carried out to customer supplied columns which can be either sent direct to us for conversion which normally takes around 14-21 working days. Full fitting instructions and a fitting kit are supplied, or alternatively book your vehicle in with ourselves and we can carry out the hard work for you. 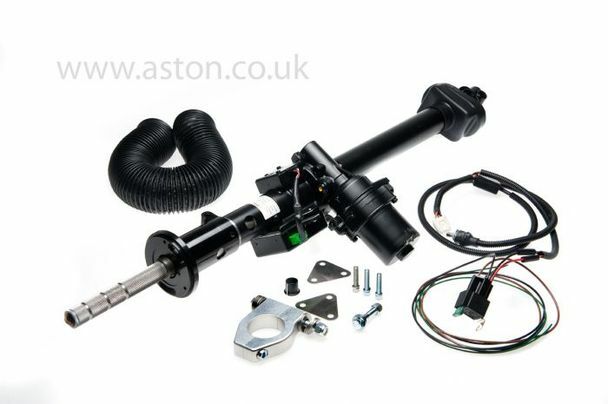 Please note that items not included in the conversion are repair or replacement of the column switch and fittings, horn push assembly, steering wheel and boss, steering rack and front suspension, carriage cost for sending rack to us from yourself.